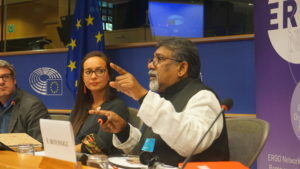 At the heart of the EU Roma Week 2019, which brought over 100 European activists and stakeholders to Brussels, policy-makers and civil society met for the first public debate on Roma and the UN Sustainable Development Goals. 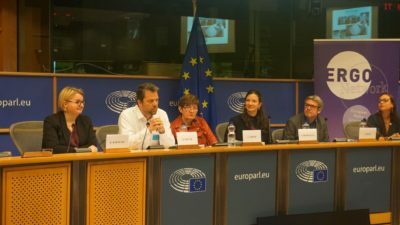 The debate was co-hosted by Cornelia Ernst, MEP of the Left Party, and the European Roma Grassroots Organisations (ERGO) Network together with Soraya Post MEP, Global Call to Action Against Poverty (GCAP) and Sozialfabrik. The debate was opened by Cornelia Ernst MEP who stated that “the global development agenda can and should be an important lever for fighting antigypsyism and racism”, calling to mind that the EU Roma Framework “has failed because it did not include the Roma community”. ERGO Network Director Gabriela Hrabanova stressed that “the 17 Sustainable Development Goals and the promise of governments to leave no one behind provide crucial opportunities for advancing the rights of Roma in Europe”. Stefan Meyer of Fresno Consulting presented the discussion paper ‘Roma included’, which was launched by ERGO Network with the event, and brought to the table recommendations for civil society on how to engage with the 2030 Agenda. On behalf of the European Commission, Katarina Ivanković Knežević, Director for Employment, Social affairs and Inclusion in DG Employment, stressed the potential of the SDGs to address questions of the inclusion and discrimination of Roma, and better take into account intersectionalities of gender and disability. Gesa Boeckermann (Policy Officer, Non-discrimination and Roma coordination Unit, DG Justice and Consumers) highlighted that not only are the SDGs an important roof for policies related to Roma but that in reverse, by achieving Roma inclusion, the EU could also make an important step in its commitment to reach the Sustainable Development Goals. Romeo Franz MEP (Greens/EFA) closed the debate by underlining that (pro)Roma activists need to use the 2030 Agenda for supporting their fight against antigypsyism, as this racism is the main reason for the social exclusion of Roma across Europe.